This article describes the various preferences that can be set in Content Station 9. Tip: When changing the font size, show one of the affected areas in the background so that you can preview the final result. The Editor Font size setting controls the font size of the text displayed in the article components of the Multi-Channel Text Editor. The Editor Line Height setting controls the line height (the spacing between the lines) of the text displayed in the article components of the Multi-Channel Text Editor. Changing one setting usually means that you have to adjust the other setting as well. Note: To see this change take effect, make sure that View > Visual Mode is off. This setting controls the language that the spelling checker in the Multi-Channel Text Editor uses. Which languages are available to choose from depends on the languages that have been set up on Enterprise Server. Note: In Content Station 9.8.12 or higher, the Spell Checker language can also directly be set from the toolbar in the Multi-Channel Text Editor. When viewing an article in the Document panel in Detail view, part of the first sentences are displayed. The setting named 'Number of Lines in Detail View' controls how many lines are used for showing the first few sentences of an article. Figure: When viewing the Document pane in Detail View (A), the 'Number of Lines in Detail View' preference (B) controls the number of lines that are used for showing the first few sentences of an article in the Document pane (C). Clicking this option makes sure that dialog boxes appear again that have been prevented from appearing by selecting the option named 'Don't show again'. 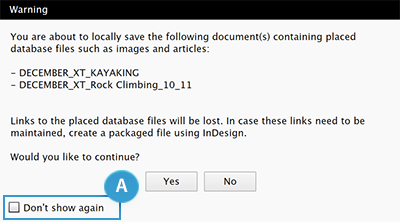 Example: When saving multiple layouts that contain placed database files onto your local drive, a warning appears to inform you that it is better to use the Package feature of InDesign so that the links with the placed files are preserved. When you are aware of this but know that you want to perform this action each time anyway, you can click the 'Don't show again' check box to prevent the dialog box from appearing each time you perform the action. Figure: The 'Don't show again' check box (A) in a dialog box. 4 September 2017: Added not about setting the Spell Checker language from within the Multi-Channel Text Editor.